You will be picked up from your hotel in Selcuk or in Kusadası early in the morning. If you have just arrived, we can pick you up from the airport, the bus terminal or train station. 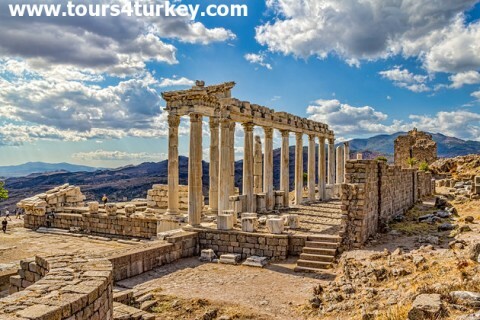 We will drive to PERGAMUM, visit AESCULAPIUM, ancient medical center built in the name of AESCULAPIS, God of Medicine. We will have a lunch break and continue to PERGAMUM ACROPOLIS. We'll visit ATHENA and TROJAN TEMPLES, TEMPLE of ZEUS, TEMPLE of DIONYSOS, GYMNASIUM of YOUTH, ODEON, LIBRARY, AGORA, GREAT THEATRE and ROMAN BATH. In the end of the tour you will be driven back to our hotel or be transferred to the airport in Izmir depending on your plan.